In the small village of Spannum, in the Dutch province of Friesland, Claudy Jongstra heads a felt-design studio whose modesty in process and material belie its overwhelming commercial appeal and architectural scale. Claudy Jongstra kneels with a family cat in the yard behind her office and home, which she shares with her partner, Claudia Busson, and their two sons, Eabal and Jesk. Behind her is a small dinghy that the family uses to navigate the numerous irrigation canals that traverse the farmlands throughout Friesland. Despite its modest scale, Jongstra’s studio has worked on major collaborations with Hella Jongerius,Tord Boontje, Steven Holl, andRem Koolhaas, in addition tofashion design for Alexander van Slobbe and costume work for Star Wars: The Phantom Menace. The back entrance to Jongstra’s office is oufitted with a sandbox and littered with her sons’ toys. A felt maker lays Drenthe wool and raw silk onto a large table lined with bubble wrap. Jongstra’s flock of Drenthe Heath and Schoonebeeker sheep are sheared yearly and provide the raw material for most of her work. The sheep roam the countryside as part of a conservation initiative to help reinforce the polders and dykes throughout the province. A dark cloak of Jongstra’s felt covers the ceiling and walls of a private residence in Amersfoort. Tiles of natural felt dot the walls in the Universitair Medisch Centrum, Utrecht. Jongstra was asked to create a warmer feeling for this wing of the medical center, where people come for radiation and chemotherapy treatment. A detail of one of Jongstra’s “hides” distributed by the textile manufacturer Maharam. Each hide measures about 4¼ feet by 8½ feet, retails for about $4,000, and is produced in the Spannum workshop. An architectural model for Claus en Kaan’s dome-shaped conference area for the House for Culture and Government in Nijverdal, which will be covered by 204 pieces of felt measuring approximately 16,000 square feet total. Jongstra’s studio will also produce a wallpaper and tapestries for a multifunctional space in the building. An example of the traditional 17th-century knotting technique, guipere. Piles of felt, civilization's oldest textile, await Jongstra's team (six felters, two dyers, three designers, Jongstra, and a business manager). Claudy Jongstra kneels with a family cat in the yard behind her office and home, which she shares with her partner, Claudia Busson, and their two sons, Eabal and Jesk. 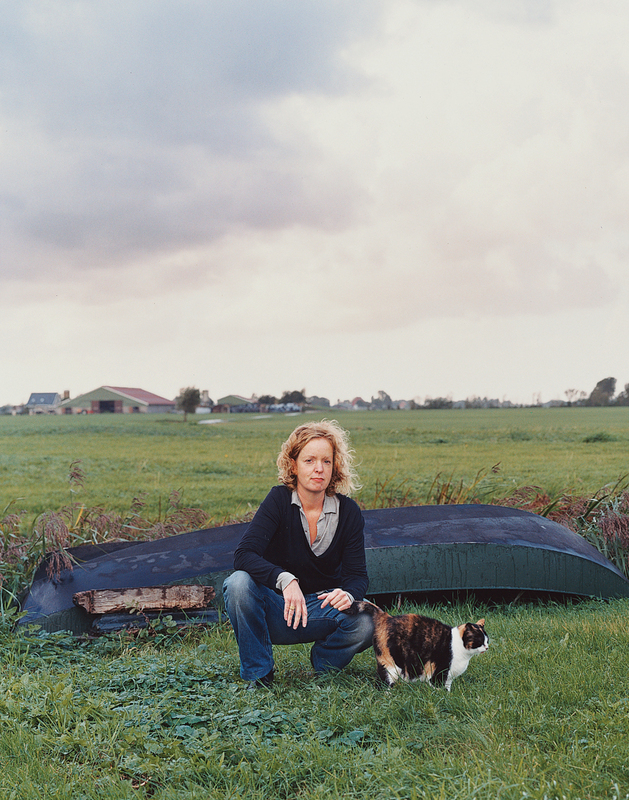 Behind her is a small dinghy that the family uses to navigate the numerous irrigation canals that traverse the farmlands throughout Friesland. Despite its modest scale, Jongstra’s studio has worked on major collaborations with Hella Jongerius,Tord Boontje, Steven Holl, andRem Koolhaas, in addition tofashion design for Alexander van Slobbe and costume work for Star Wars: The Phantom Menace. Photo by Adam Broomberg. It takes about two hours to get from Amsterdam to Spannum, where felt maker Claudy Jongstra lives and works. According to Suzanne Oxenaar, artistic director of the Lloyd Hotel, the train is the best way to travel. “You get a real sense of the Dutch countryside,” she says, drawing her hand horizontally through the air with a whistle: Dutch for “flat.” I sit with Oxenaar in the capacious restaurant/common area at the Lloyd, where Jongstra is one of several Dutch artists and designers commissioned to furnish the place. In front of me, Jongstra’s Japanese-inspired shutters dress each of the double-height windows; to my left, a Jongstra-designed throw shrouds a leather sofa, looking much like the pelt of some fauvist beast, dyed in a hue that would shock Elsa Schiaparelli. Even from this cursory survey, it’s clear that despite the humbleness in material and process, Jongstra’s interpretation of felt, civilization’s oldest textile, is to be prized. Jongstra meets me at the train station in Leeuwarden to take me to her studio in the outlying village of Spannum. As we drive out, the bustle of Leeuwarden gives way to what to me is a quixotic countryside, polders traced by tiny canals and punctuated by windmills and cattle. The move from Amsterdam to Spannum, which is in the province of Friesland, was a positive one, Jongstra explains, adding that despite the area’s relative provinciality, she likes the open space and being closer to her sheep. Other creative workshops, like Royal Tichelaar Makkum, are located nearby as well, ensuring that she and her team do not feel creatively marooned. When we arrive at her studio, which is composed of three buildings (her home, a small studio office, and the werkplaats where all of the felting is produced), I am surprised and charmed by its diminutive scale. A felt maker lays Drenthe wool and raw silk onto a large table lined with bubble wrap. Photo by Adam Broomberg. Jongstra’s operation will soon include a natural dying component headed up by Marjo Moeyes, who studied and documented natural dying processes in Thailand for five years. “One of the challenges with the felt making was not to do it in the ‘hobbiesphere’ but to do it in a larger scale,” explains Jongstra. By vertically integrating, she feels she’ll have more control over the final product. “This is really important,” she explains, “because we want to ensure that this knowledge will be kept.” Jongstra even hopes to grow Wouw, the flower that 17th-century Frieslanders used to dye their trousers and from which she derives a vibrant celadon-tinged yellow. Jongstra keeps a flock of 200 sheep, 150 of which are indigenous Drenthe Heath sheep, a long-haired breed employed mainly for vegetation management. This is why they (and now we) are on the move, driving around the countryside, trying to contact the shepherd via a mobile phone. The humor is not lost on Jongstra, who laughs and rolls her eyes when we arrive at the wrong plot of land. Jongstra strives to run a thoughtful, creative company, but she is also a sharp businesswoman. A dark cloak of Jongstra’s felt covers the ceiling and walls of a private residence in Amersfoort. Photo by Adam Broomberg. When asked how large she wants the business to get, she says, “Of course we have to grow, but it isn’t a question of how to grow. I think we want to do one or two big projects a year, and then just small work. You know, because what is your happiness?” “Worth” is lost in the translation, but I take her point. And for Jongstra’s patrons, her happiness is worth quite a lot. Murray Moss, founder of the New York shop Moss, sells a long, loosely knotted strand of hand-spun drenthe wool for $550. Michael Maharam, principal of the eponymous U.S.-based textiles manufacturer, says of his company’s collaboration with Jongstra, “We’re interested in exploring luxury right now—the luxury of simplicity.” Jongstra’s overarching appeal suggests a collective desire for simplicity. The fact that consumers would find value in a strand of yarn that, to a traditional craftsperson, would be considered poorly spun and thus worthless, is telling.